The original Pillars Of Eternity was an excellent revival of classic-style PC RPGs (think Baldur’s Gate, but shinier). It also made gobs of cash on Kickstarter. Now Obsidian’s making a sequel, and they’re tapping the ol’ crowdfunding well one more time. Instead of going back to Kickstarter, Obsidian’s crowdfunding Pillars Of Eternity II on Fig, the service used by games like Psychonauts 2 and Rock Band 4, where they’re hoping to raise a minimum of $1.1 million. Fig, unlike other crowdfunding platforms, allows people to invest in projects and potentially share in the profits. Obsidian says $2.25 million is open for equity. I’d advise that you regard that proposition with skepticism, though, given that we don’t have much evidence of how it works out with video games. Bottom line is, Obsidian is asking for $1.1 million, the same goal they set for the first Pillars Of Eternity. Contribute if you want a video game. 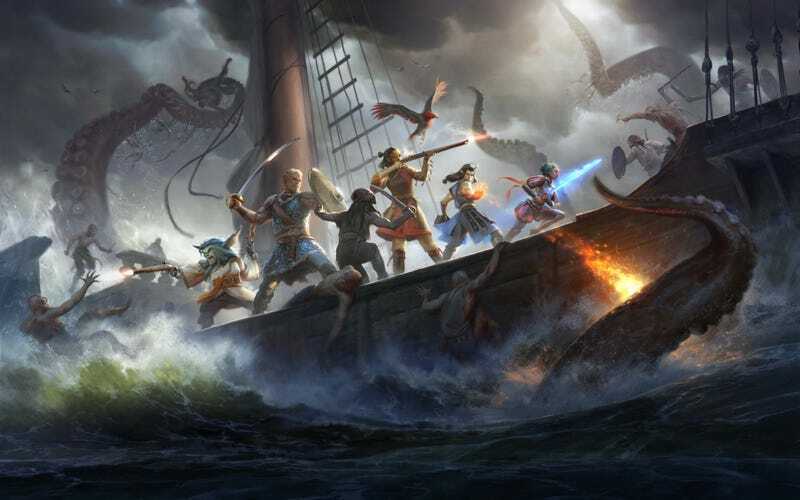 Pillars of Eternity II is subtitled Deadfire, and it takes place in an island region called Deadfire, as opposed to Doubtfire, Starfire, or Angel Fire, New Mexico. You, reprising your role as Watcher from the first game, venture to Deadfire after Ethoas, god of light and rebirth, rises up and wrecks your home base. Choices from the original Pillars will apparently carry over, and the game world will be even more reactive this time around, with NPCs offering different quests based on when you approach them and what they’re up to at the time. There’ll also be new companions, new spells, new weapons, and all that fantastical twelfth dimension jazz. Seems like it’ll be a sequel in the style of Baldur’s Gate II: similar to the first systemically, but with smart tweaks and lots of new Stuff (TM). It’s not another Tyranny or anything like that. What do you, the people, the pillars of this eternity we call a video game blog, think?